NIGERIA:: The Nigeria Police confirmed that they had actually barricaded Senator Dino Melaye’s house, insisting that he must surrender or they continue the siege emplaced to take him in for trial over alleged attempted culpable homicide. A statement from the Police Public Relations Officer, Deputy Commissioner of Police, Jimoh Moshood explained that they needed him to face trial for the alleged shooting one Sergeant Danjuma Saliu while on duty on July 19, 2018 in Kogi State. However, a statement earlier issued by the besieged Senator raised the alarm that the police had surrounded his house with the intention to plant guns and turning round to accuse him of misdemeanor. His party, the Peoples Democratic Party (PDP) also issued a statement alleging that the ruling party was deploying the police as agents of the state to harangue their members for allegedly booing President Muhammadu Buhari during his budget presentation to the joint chambers earlier in the month. 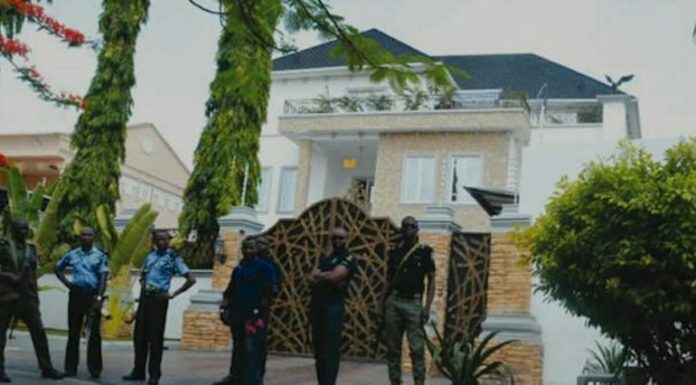 According to the PPRO, “The Police operatives currently in the residence of Senator Dino Melaye are to effect his arrest to answer to the case of attempted culpable homicide on the shooting of a Police Officer, Sgt. Danjuma Saliu, attached to 37 Police Mobile Force (PMF) while on duty at a stop and search point along Aiyetoro Gbede, Mopa Road in Kogi State. “The above offence was committed by Senator Dino Melaye and his armed thugs in Kogi State on the 19th July, 2018 when they shot and wounded a police officer, Sgt. Danjuma Saliu, attached to 37 Police Mobile Force (PMF) while on duty at a stop and search point along Aiyetoro Gbede, Mopa Road in Kogi State.